This dispatch comes to you from the “If you repeat a lie often enough, people believe it” department. 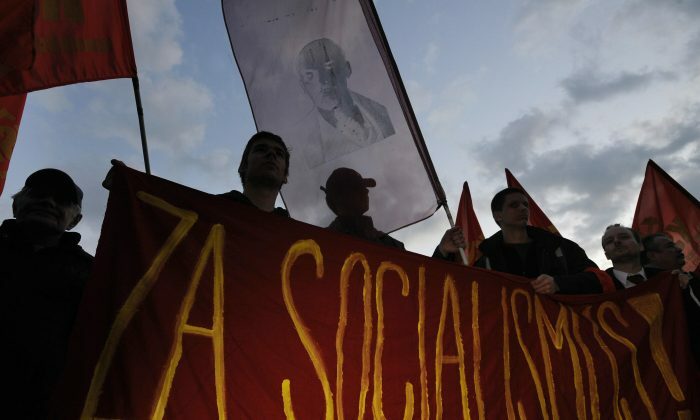 The revelation: 37 percent of American adults prefer socialism over capitalism. So says a February survey by the American Culture and Faith Institute. Consider it a wake-up call. Sen. Bernie Sanders’s 2016 presidential campaign put an exclamation point on socialism’s increasing popularity, but socialism became more fashionable before that. Academics and politicians, especially, like to stress the technical differences among the various theoretical forms of socialism and those of communism. However, in the minds of most people (like those surveyed), the distinctions are blurry and often not meaningful. To put it another way, communism is the logical endpoint for socialism, according to Lenin and others. While many socialists don’t wish to go, in their own programs, as far as the destructive and deadly extremes that communism is noted for, there are always dedicated communists waiting in the wings to bump them off the stage (or bump them off, period) when the time is ripe. When the socialism genie is out of the bottle, moderation declines. Why would so many Americans hold positive views about socialism? Let’s look at two categories of survey respondents, with the acknowledgement that many could be in both categories. We learn as children that “sharing is nice,” so isn’t an economic theory that advocates sharing resources a nice theory? We need to realize that some vague notion like “sharing is nice” could summarize all of what some people know about socialism. We all sometimes form opinions based on overhearing a conversation, seeing a snippet of something on TV or in a movie, catching a headline on a website or in a newspaper, or other happenstance. It’s knowledge acquisition by chance, often superficial and often misguided or wrong. If a charismatic actor declares his love for socialism on an entertainment website, the survey numbers will get a bump, with no further questions asked. Younger people have no personal memories of the Berlin Wall or the Cold War and all that those things mean to older generations. So millennials and members of generation Z are more easily influenced in their understanding of socialism by chance acquisition of knowledge, by images from popular culture, or from calculated messages by those who promote socialism (and by extension, communism). This leads us to the next category. Most of us sometimes form opinions based on sober reflection, informed by our personal study of an issue and our formal education. Is the formal education system in the United States fully focused on preserving and upholding longstanding American values, such as those in the Constitution? Or is it an open system susceptible to being gamed by special interest groups intent on promoting other agendas? Sadly, schools, colleges, and universities seem to increasingly be ideological battlegrounds, with the prize being the minds of impressionable young people. A January report by the National Association of Scholars (NAS) outlines how educational institutions are systematically inculcating socialist ideas. The report’s abstract says: “A new movement in American higher education aims to transform the teaching of civics. … What we call the ‘New Civics’ redefines civics as progressive political activism. Rooted in the radical program of the 1960s’ New Left, the New Civics presents itself as an up-to-date version of volunteerism and good works. Back to the 37 percent who prefer socialism over capitalism. It’s not the sign of a superior ideology gaining traction, and it’s not an accident. It’s the result of calculated, long-term efforts to inject certain ideas into the population via the formal education system. Where do our beliefs, our ideas, and our assumptions come from? Where are our children’s coming from now? It’s a good time to pause and reflect. As a nation, our future has been, and always will be, guided by our beliefs, ideas, and assumptions. We owe it to the future to be aware of them and take responsibility for them.